Posts & Ropes Hire from Aries Leisure in Liverpool, Merseyside, Wirral, Lancashire, Cheshire, Manchester and throughout the North West. Hire the Posts and Ropes on their own or add a red carpet with them and give your event the red carpet treatment, this will make your guests feel very important and this is also a great photo opportunity to take pictures of your guests as they arrive. Delivery Only – Delivery Charges apply depending on Postcode. Call Aries Leisure today for a FREE quote on Posts & Ropes Hire in Liverpool, Merseyside, Wirral, Lancashire, Cheshire, Manchester and throughout the North West. 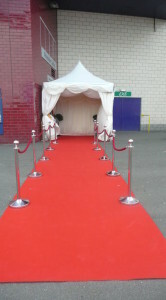 Aries Marquee Hire Posts & Ropes Hire and Red Carpet Hire throughout the North West. We are always happy to discuss your requirements, please feel free to call us on 0151 545 0599 and speak to one of our friendly staff. Alternatively, please feel free to email us with your details – we normally respond to all enquiries on the same day.